Paul Rudd and Calista Flockhart in the Showtime production of "Bash"
"Atrocity is &#145;the new black&#146;," says filmmaker and playwright Neil LaBute (Your Friends and Neighbors, Nurse Betty) in the introduction to the programme for the Dublin run of Bash. The play is a dark vision of casual atrocity; "matter of fact brutality" as LaBute puts it, in which understandable individuals with mundane characteristics inflict pain on themselves and others in the name of prosaic goals with socially insignificant results. The work takes the form of an assemblage of three monologues themed around ordinary people who commit murder. The author reinforces the awfulness of the crimes by framing them with stories which lack a sense of redemption or catharsis. Each piece is instead a testament to the creeping horror which has enveloped the murderers (or is poised to) even as life goes on as if what they had done had never happened. The first piece is entitled "Iphigenia in Orem." In Greek myth, Iphigenia, the daughter of Agamemnon, sacrificed herself willingly so that her father and her country might prosper from the favour of Artemis. LaBute reenvisions the myth in contemporary terms. It features Jason Patric (Your Friends and Neighbors) as a Utah businessman whose eight month old daughter has died. He reveals to an unseen guest in a hotel bedroom precisely what happened and why (the actor picks an audience member in the front row to focus upon as he speaks) The play explores how a loving father could allow his child to die in the name of much less noble a cause and circumstance when his job is threatened by an aggressive female colleague. Patric&#146;s performance and delivery are superb. He captures the sense of restless fatalism which has infected his character and is gnawing away at his soul. Though he continually assures us that &#145;life goes on&#146;, it is clear that he has been deeply affected. The knowledge of his secret crime can never be reconciled with his everyday life. The irony is that the corporate and collegiate relationships which form a backdrop to the action show how empty that life is compared to the kind of monumental significance of the original myth, making it all the more terrible that this has happened at all. The second piece, "Medea Redux," is set in what seems to be an interrogation chamber where Flora Montgomery (When Brendan Met Trudy) portrays a woman explaining how her relationship with a high school teacher when she was thirteen has eventually led to the murder of her fourteen year old son many years later. Medea is of course one of the best known figures in Greek mythology, and was recently revisioned for the stage with Fiona Shaw. LaBute here delves into the complexities of motivation, allowing his character to gradually unfold the layers of detail which neither explain nor justify her actions but provide a glimpse of where they came from. The character&#146;s final revelation that she had planned her crime for a very long time asks the audience to reflect on the tone and content of what she has said, which often sounds like romantic fantasy, to seek out resolution. There is none. Again the performance is vitally important to the overall impact of the piece. Montgomery handles the combination of moods well, alternating from the halting disposition of what is described as "an inward person" to the cheerfulness of a schoolgirl to the brooding coldness of a woman who has killed her own child. The piece on the whole feels a bit more forced than the opener though, but it is thematically consistent, well worked, and interesting as a text. The final segment, "A Gaggle of Saints," features Jason O&#146;Meara and Justine Mitchell as a pair of conservative college sweethearts who have traveled to New York city for a big party (bash). This piece comes after the interval, and begins in an upbeat and lighthearted manner, laden with the cliches of the American college dating scene. O&#146;Meara is particularly funny as the irrepressibly jock-ish paramour who describes with cheerful abandon how he beat his girlfriend&#146;s former boyfriend unconscious on the track one day. Mitchell is also fun as she talks about preparing her taffeta dress and new shoes for the big occasion and affects a similarly self-contained and oblivious persona. Having been primed by the first two pieces, the audience of course expects all of this vacuousness to be subverted, and it is. The expectation of horror underlies the descriptions of mundane activities, making our reaction to these stories of college hijinks one of equal discomfort and disgust to that which follows when the atrocity itself occurs. The play&#146;s title is brought into effect again as the male and several of his friends beat a gay man to death in a public toilet in Central Park. The fact that their crime is followed by a prayer serves to again reinforce a sense of hypocrisy and mixed motivation, or at least fathomable if intolerable justification. This tale features a character in the earliest stages of his reaction to what he has done (in contrast to the first, where the murder took place years before, and the second where some time has elapsed), and though its effects are therefore less pronounced, the audience understands again that it will eventually consume and destroy the killer on a fundamental level. 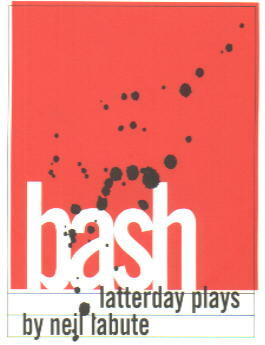 Bash is a serious and absorbing work of theatre. It has been running since 1999 on stages around the U.S. and was filmed for Showtime in 2000. The Dublin production is well designed, crisply lit, and superbly performed. As a play in itself it is thought-provoking, refusing to provide easy answers and mercifully not opting for postmodern amorality in dealing with these themes. It aims for discomfort and achieves it, which is something seen relatively rarely on the Irish stage (though, curiously enough, some of these same ideas were featured in the theatre&#146;s previous presentation, Therese Raquin).